Now in its 18th year, the Rhode Island Chinese Dragon Boat Races & Taiwan Day Festival is an extraordinary event for the whole family to enjoy. Join the thousands of people who attend each year for exciting competition, family-fun, and a great opportunity to learn more about Chinese culture. Racers continue to use the fiberglass Taiwanese-style dragon boats gifted to them from the Republic of China (Taiwan) and incorporate the skill of flag-catching in each race. The course length is 1,000 feet long up the Pawtucket River, with three boats racing at a time. 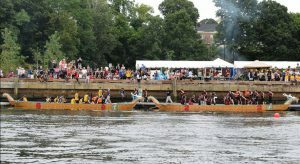 A unique element to the races is the larger Taiwanese-style dragon boats, wood paddles, and the flag-catching in each race. If the flag is missed a penalty is added to their time. 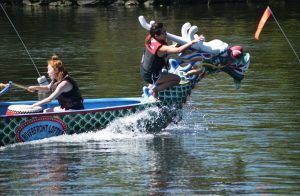 Sanctioned by the Eastern Regional Dragon Boat Association, the RI Chinese Dragon Boat Races consist of two divisions: the Mixed Division, which requires a minimum of 6 female paddlers, and the Open Division that has no gender restrictions. 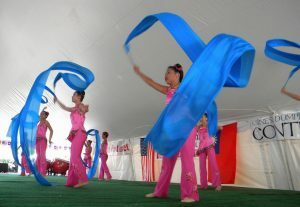 In addition to the exciting boat races, under the giant tent you will find Taiwan Day festivities with some top notch entertainment including cultural performances, many art & crafts tables, and the ever-popular dumpling eating contest. The festival also has a great selection of vendors, interactive activities, and food trucks. With so much to see and do…the Taiwan Day Festival is truly a great opportunity to witness some wonderful traditional Chinese and Taiwanese entertainment. Parking and shuttle buses: Parking and shuttles for teams and attendees will be located at the Blackstone Valley Visitor Center‘s lot, 175 Main Street, Pawtucket, RI. Shuttle buses will start at 7:00 am and run until the awards ceremony has been completed. Location: Festival Pier, Pawtucket River, Pawtucket, Rhode Island. 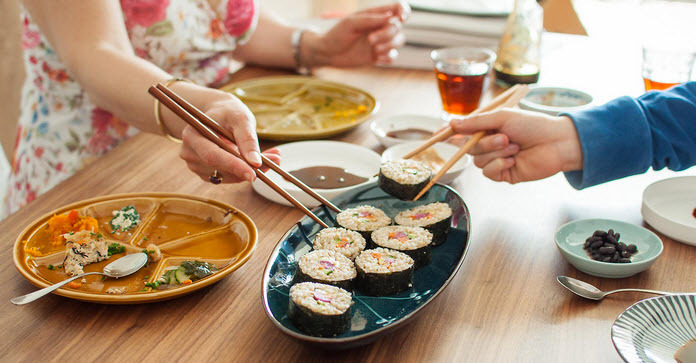 An international idea celebrated in 50 countries, Restaurant Day is a food carnival created by food-loving people setting up one-day restaurants. The idea of the day is to have fun, share new food experiences and meet others in our community. People offer their family cuisine, favorite recipes, desserts or whatever in their backyard or a park. Prices are very inexpensive. Check the maps to see if there is one in your city. Tea, which is over 5,000 years old, was possibly born in the Yunnan province of China. Legends mention Shen Nung, an early emperor and scientist, who ruled that all drinking water be boiled as a hygienic precaution. One day while traveling, his servants boiled water for him, and just then dried leaves from a nearby bush fell into the boiling water. The emperor drank the brown liquid and enjoyed it. In 800, Lu Yu wrote “Ch’a Ching”, the first definitive book on tea. He diligently recorded the various methods of tea cultivation and preparation. Zen Buddhist missionaries later introduced his meticulous methods to imperial Japan. One missionary in particular, Yesei, had observed its use in religious ceremonies in China and appreciated its value, and there are records of his findings. Tea was so highly thought of in Japan that the serving of it was elevated to an art form, resulting in the Japanese Tea Ceremony. While visiting Japan I was privy thrice to this exacting two hour ceremony while sitting on bended knees – once by a Buddhist Monk in a temple, once by a Canadian Tea Master and once in a private home while dressed in a kimono. Perhaps one of the first Europeans to encounter tea and write about it was the Portuguese Jesuit Father Jasper de Cruz (in 1560), and around that time a Dutchman named Jan Huygen van Linshoten visited Java. He wrote about his voyage to the East Indies in 1598 and mentioned “cha”, as it was called in Mandarin. 49 mySQL queries executed in 0.350 seconds.